Hiking poles are a must. 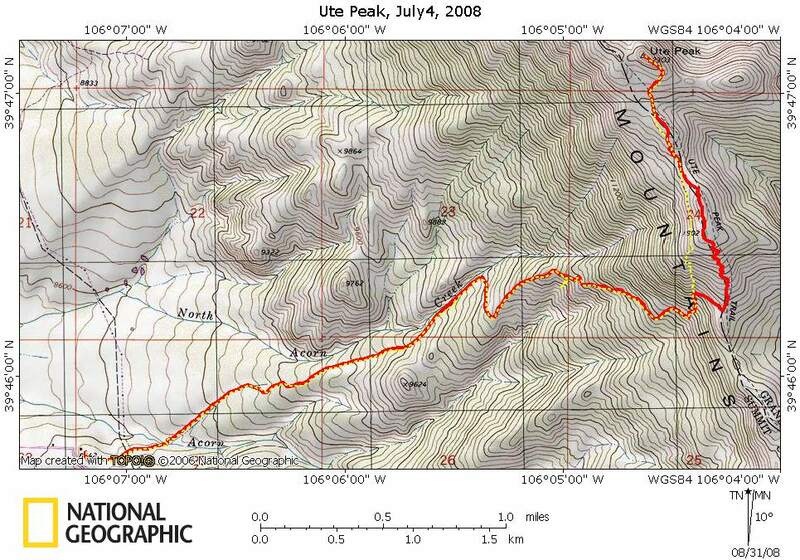 We choose to summit Ute Peak from the Acorn Trail route rather than Ute Pass road. I screwed up and did not save the topo tracks in a way that gets the times. However certain landmarks I did way point. Marina and I were in much better shape than in 2007 when we did the Acorn hike as we made the saddle an hour faster. This time, the bugs in the lower valley were really bad compared to June of last year. As hot as it was, long pants and sleeves were a must. But to balance out the bugs, the Columbines were out in force. I will leave the description of the hike up to the saddle to the previous Acorn Creek Hike. We left the saddle heading more or less north and climbed to the summit of the first false peak, at first following a trail, but then the trail disappeared so we just switchbacked to this summit. We then basically continued to follow the ridge hitting a couple of additional false summits. The trail leaves the Ptarmigan Peak Wilderness. Just before tackling the real summit, we stopped for lunch, and then left are back packs and obtained the real summit. On the way back down, we tried to avoid the first false summit and ended up in a bowl of loose dirt and scree. We had to be careful working our way down. The net is although it may have been shorter and did not have the ascent back to the first false summit, it was slower and much more difficult. The descent is shown in yellow on the topo. I will get flowers up at some point. Marina made the summit before me as I was taking pictures of a small patch of Columbines. Here I am, with Greys & Torres right above my head. Marina took this picture on our way down. The summit is seen in the upper center. I am next to the Ptarmigan Peak Wilderness boundary sign.